Your purchase comes with everything you need to save the teacher! 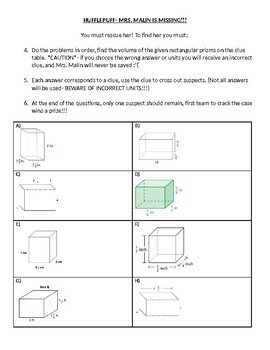 Your scholars will get 8 problems on Volume of a rectangular prism with fractional side lengths. 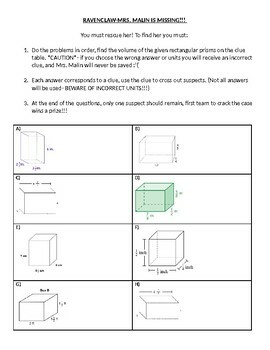 Each problem's answer has a clue, and scholars can use their clues to narrow down the suspect list. If everything goes right, at the end of the 8 problems they should know who kidnapped their teacher! 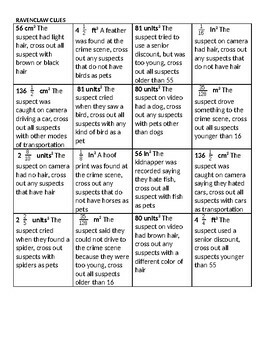 There are 2 different sets (same questions, clues, and suspect lists) with 2 different perpetrators, I did this to leave as sub plans so one class couldn't spoil the game for the other, you can edit the perpetrator to make more sets. 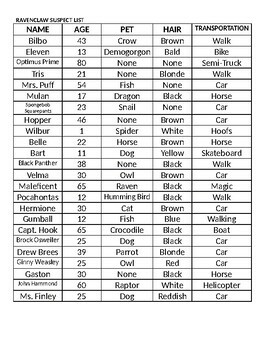 The 2 sets are marked by their crew (class) name, Ravenclaw or Hufflepuff. This file is easily edited so you can change it to your name, and suspect names can always be changed to your scholars.